My friend Angelia came to visit me in LA over the 4th of July. We spent lots of time in the lovely Los Angeles sunshine and in our swimsuits. She had the cutest suit on by the Australian brand, Triangl. Their suits are made of neoprene, which is what wet suits are made of. It is a thick, water friendly material. The swimwear comes in bright, poppy colors and fun color block designs. The bottoms are low cut and stay put. The plus side of the thicker material is a fuller coverage and non-see thru assurance. I love the color combinations offered and that you can order different sizes for the tops and bottoms. I wear a size 25/26 jean and wear a size small. I was such a fan of Angelia’s suit that I purchased one of my own, with her permission of course. The style of bikini I bought was the Bambi and in the Sugar Plum color. I am such a fan of this line, I want to buy many more and it is very affordable at $79-$89 per set. The Bambi is $79. They ship straight from Australia and I got it in the mail within a few days! Visit http://www.international.triangl.com to purchase yours! One of my favorite places to dine with my friend Randi was Susan Feniger’s restaurant, Street, here in LA. Our favorite dish was the Kaya Toast. It was to this day, one of the best things I have ever eaten. The Kaya Toast is like a grilled cheese but instead of cheese in between the bread, it is coconut jam and butter. She toasts two pieces of white bread together to keep the middle of the bread u toasted and soft and the outside crisp. Then the chef spreads the coconut jam on both soft sides of the pieces of bread and slices cold butter and lays that on top of the coconut jam on one side of the bread. The then put the slices of bread together and forms and sandwhich and sets that aside. An eggs is softly boiled and is laid on a plate and drizzled with dark Korean soy sauce and sprinkled with white pepper. The sandwhich is sliced into quarters and placed on the plate next to the egg. To enjoy this dish, you take the squares of the filled bread and dip them into the runny egg yolk, soy sauce mixtures and take a delicious bite. It seems simple and a little weird, but I swear it is one of the most tasty and amazing flavor combinations I have ever encountered. To my sadness, Street has closed but the recipe for Kaya Toast lives on! See below for how to recreate this delectable delight at home. In a small sauce pan, mix together the coconut milk and 1/2 cup sugar. Stir in the pandan leaves and salt and bring to a boil over high heat. Keep the leaves submerged in the milk to soften. When the milk has come to a boil, remove from heat and let mixture steep for 10 minutes. Remove leaves from milk and squeeze any liquid from the leaves into pan. Throw away the leaves. In a medium stainless steel bowl, whisk together the eggs, yolks and remaining 1/2 cup sugar. Whisk in the coconut mixture to form a custard. Place the bowl over a simmering pot of water and gently cook the mixture while constantly stirring for 15-20 minutes with a rubber spatula. The final texture should be a thick custard texture. Immediately remove from heat and transfer to a medium bowl set over a bowl of ice water and stir until the mixture cools. Cover and refrigerate until needed. Makes about 2 cups and will keep for one week in the refrigerator. Take two pieces of toasted white bread and lay them out, soft side up. Spread two tablespoons of coconut jam on both untoasted sides of bread. Use a stick of cold salted butter to cut slices from and lay them over one side of the jam topped toast. Put the two slices of bread together to form a sandwhich and slice into quarters. Soft boil and egg for approximately 6 mins and keep the yolk soft. Lay that on a plate and top with dark Korean soy sauce and a dash of white pepper. The Kaya Toast is ready to be devoured. Living in LA, vegan and faux leather options are all the rage. I have never found a handbag I have liked that wasn’t real leather. The reason is the faux options tend to look cheap and do not wear well, with the styles sometimes being dated and more trendy than classic. Well, listen up all you hippie dippy, kind hearted souls….there is a fabulous array of handbags that won’t break the bank and will keep your conscience clean. 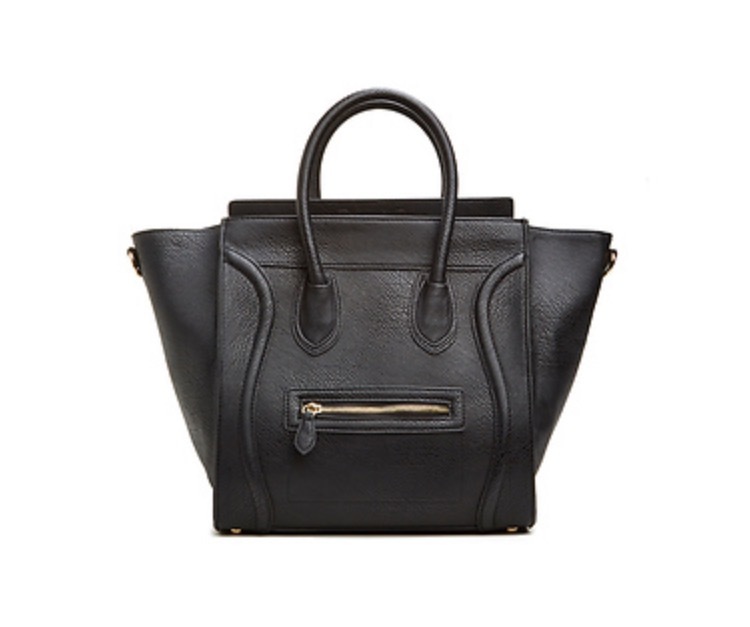 I have fallen head over heels for the Large Structured Handbag from the Daily Look. This bag resembles the Celine bag that everyone owns, but is only a fraction of the price and is a fashionable non-leather option for those who simply will not wear leather. I still love the Celine bags out there and of course, would love to own one, but this is a wonderful way to get the look without wearing leather and compromising on durability, feel, and style. I purchased the beauty in black and love the versatility of it. You can add the long strap to wear it on your shoulder and also expand the sides to accommodate an iPad or some magazines and snacks for the plane. I was so pleasantly surprised when I received this handbag in the mail and took it for a spin around my neighborhood. I already have received so many compliments and cant wait to take it out more. You can buy this bag at http://www.dailylook.com for $74.99 in black, navy, or raspberry. I recently went to Scottsdale, Arizona to visit some dear friends of mine. As I was in AJ’s specialty store picking up some flowers for a friend that has been ill, they were sampling Fixx Chocolate Bars. I admit, I was skeptical and just thought, okay, I will have a little bite of sugar while they wrap my flowers. 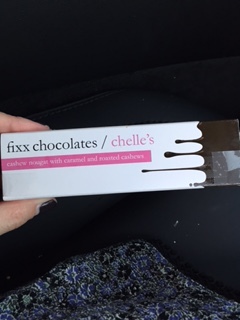 I was so very pleasantly surprised when I tossed the first bite of the Chelle’s bar in my mouth. It is a handmade chocolate bar that is comprised of creamy cashew nougat, caramel, and roasted cashews. Um….move over Snicker’s bar… Sheriff Chelle is in town. 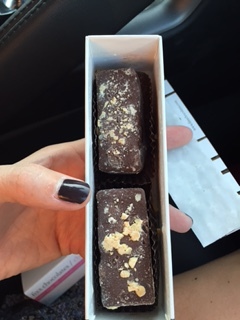 This dream of a chocolate bar was so beautifully presented in two smaller bars in a white box. They are fancy little chocolate bars that are full of the most expertly mixed flavors and textures that delight the tiny little taste buds and make your eyes light up with joy. The Fixx bars are the best chocolate bars I have tasted in a long time. And anyone that knows me, knows that I will never pick chocolate as my favored treat, but in this case, I have been won over and in fact, I now crave it. I will start lobbying to all the local markets to start stocking my new favorite candy bar so I can get my weekly Fixx. Yes, fellow skinny girl Angelenos, I will openly admit that I am going to eat sweets every week! If you are lucky enough to live in Scottsdale, venture out to AJ’s and grab as many bars as you can because when I went back for more, they were sold out! Make sure you are going straight home though, because although the pretty box it comes in will protect it from getting crushed, that Arizona heat is sure to melt it in mere seconds. I mean I almost melted in that heat too! I have become a full on stalker of Rene Caovilla shoes. I was at Saks Fifth Avenue in Beverly Hills the other day and I was consumed by the most beautiful shoes. You all know how much I love anything that sparkles, so naturally these shoes are for me. I am attending a dear friend’s wedding at the end of June and am deciding between a glitzy dress with plain shoes or a classic dress with stunning shoes. These gorgeous black satin shoes that are fully encrusted with the most sparkly stones have made it to the top of my wish list. The only problem is they are $1695! Thus, why I have become their stalker. The minute these beauties go on sale, they will be on my feet and I will never take them off. A Cinderella moment of sorts, but no prince or step sisters. I have noticed many brands doing embellished shoes, but Rene Caovilla exudes elegance. Some of the other brands, though still pricey, radiate more of a bedazzled at home with a glue gun look. While I do appreciate a good craft project, I will leave it up to the pros when it comes for fancy footwear. These shoes should be the standout part of the outfit and not compete with any other accessory. Keep the dress simple and you will for sure be on the best dressed list. I am a sucker for coupons and samples. All my friends think I’m insane, but I LOVE a good deal! So when Bath and Body Works sent me a coupon for a complimentary travel size signature scent and 20 percent off my purchase, I darted to the store. I sniffed all the scents and chose Lush Pink Dragonfruit from the new spring line. I used it tonight during my ritual evening shower and was captured by the scent. It is delicately fruity and transported me to my last vacation. I am obsessed!! And of course it is a pretty pink color, my favorite. The scent is contains notes of Dragonfruit, wild water lilies, pomegranate caipirinha, jungle plum, and passion fruit nectar. It is a lovely combination. The extra bonus is the shower gel has Shea butter, vitamin E and aloe so your skin is not only clean but well moisturized. The shower gel retails for $12.50 and can be purchased at Bath and Body works.